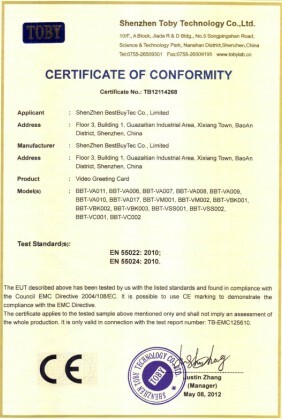 Company Overview - ShenZhen BestBuyTec Co., Ltd. The 2nd largest Video Brochure Manufacturer!2 years warranty!Innovative and new projects welcome!Urgent orders acceptable!Who I am (About us) We've operated for 8 years, and we are specializing in the collection of Video Greeting Card (Video Brochure).CapabilityWith 15 staffs in R&D team, 5 new products launched monthly.ExperienceSo far we've covered more than 30 countries and regions all over the world, including America, Europe, the Middle East and Asia. We are big enough to make your large order happen but are small enough to care about everyday smaller orders also.Production capacityWith an area of 1,000 square meters factory, our video greeting card Monthly production capacity reaches 50,000 pieces.How to assure our quality which customers care mostRaw materials and components fully checked before mass production, half and finished product full checked. Our attention to quality ensures that every task, process and production is assured of the high quality at right price. CommitmentWe are a reliable supplier, and we take our responsibility for our customers and staff.